Discover all that the Florida Keys has to offer on a stunning 15 minute helicopter ride. Take flight and soar over the pristine waters surrounding Duck Key and Hawks Cay. Duck Key is famous for its several hundred Caribbean-style cottages all with water views, porches and white-picket fences. Duck Key is halfway down the keys offering secluded waters in a convenient location close enough to Miami. You’ll see people fishing within reach of the Gulf Stream, diving the only living coral reef in the continental U.S. and you might even spot some bottlenose dolphins. 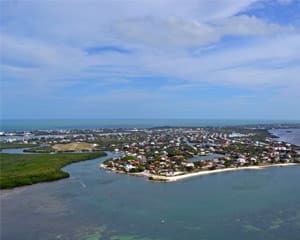 Soar over the isles and clear waters on a helicopter ride in the Florida Keys. Book today!